This weekend, a wedding took place in Bavaria between a countess and her American-born groom. It all sounds rather run-of-the-mill -- until you realize that the bride is a descendant of the Habsburgs, the Wittelsbachs, and the Savoys. It should come as no surprise, then, that a major royal tiara popped up on the bride's head! On her mother's side, Anna Theresa is a great-granddaughter of Emperor Karl I and Empress Zita of Austria-Hungary; her grandfather was Karl and Zita's second son, Robert, Archduke of Austria-Este. Robert married Anna Theresa's grandmother, Margherita of Savoy, in 1953. Margherita was the daughter of Amedeo, Duke of Aosta and Princess Anne of Orleans -- which of course means that Anna Theresa is descended from the former reigning families of Italy and France as well as those of Austria and Bavaria. 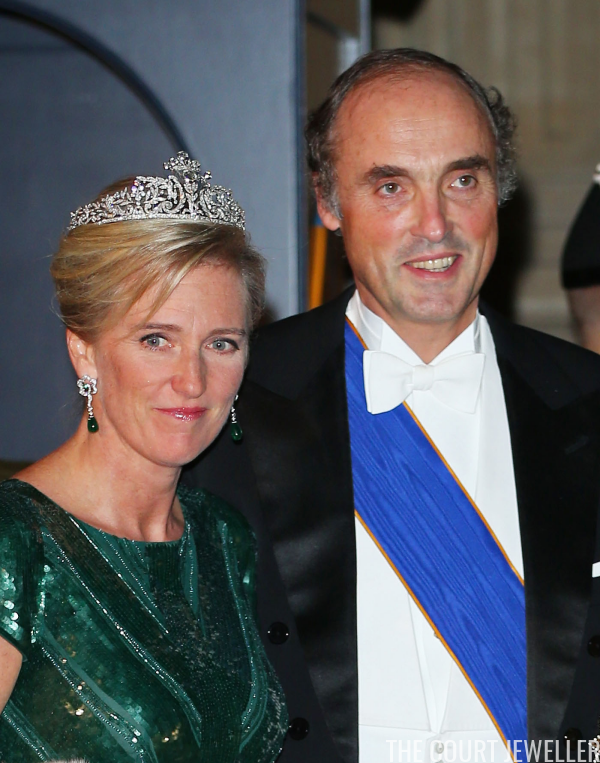 Anna Theresa has several royal aunts and uncles on her mother's side of the family, but perhaps the best connected is her Uncle Lorenz -- Prince Lorenz of Belgium, who married Princess Astrid of Belgium in 1984. Prince Lorenz gained his Belgian title in 1995, and when his father died in 1996, he also became head of the House of Austria-Este. 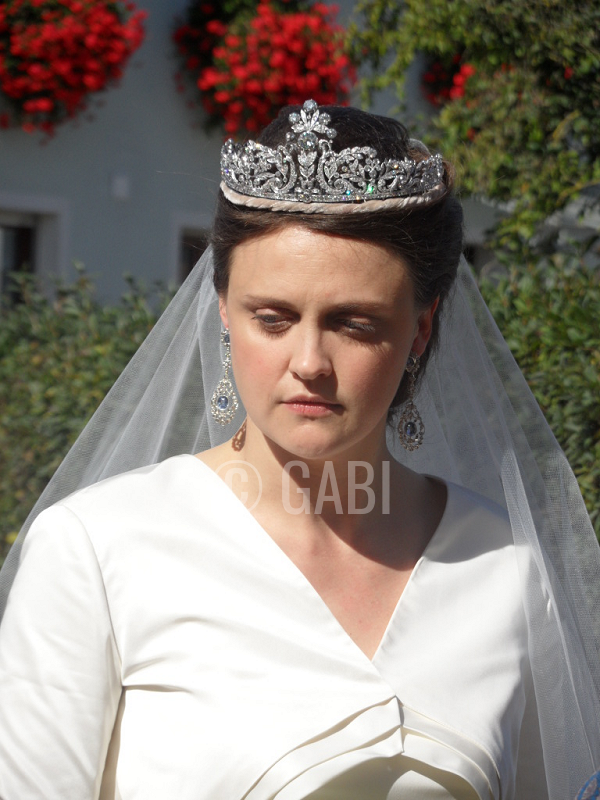 For his niece's wedding, Lorenz loaned her the Savoy-Aosta Tiara, which is most often worn today by Princess Astrid. (Yes, I know that many of you will complain that the tiara's base is still wrapped in blond-colored velvet to match Astrid's hair. Perhaps we should just be excited to see it worn by a different member of the family, regardless?) You can read more about the tiara's history here. 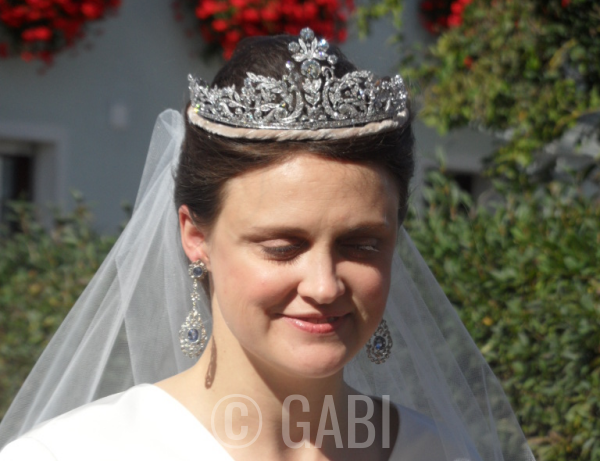 Anna Theresa wore the tiara with earrings borrowed from her mother. 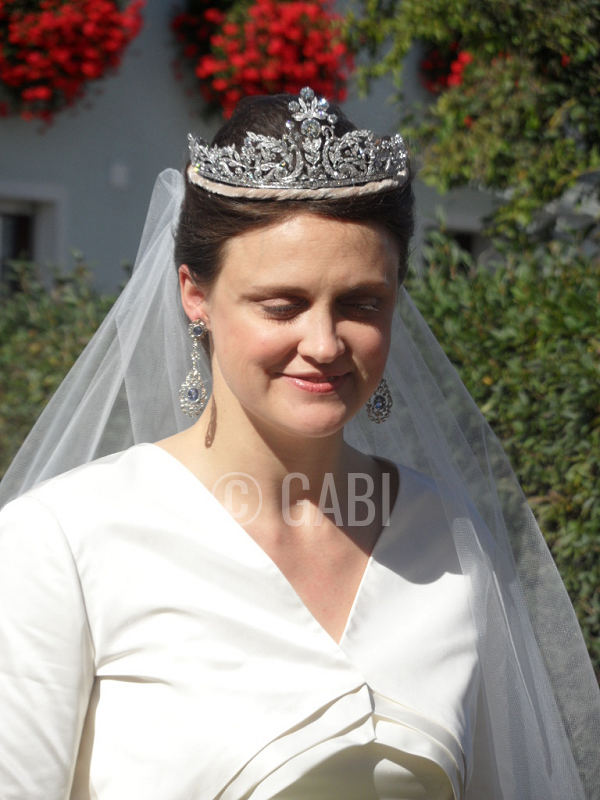 Here's a look at Princess Astrid wearing the tiara in October 2012, during the wedding festivities for her cousin, Hereditary Grand Duke Guillaume of Luxembourg (who also happened to be a witness at this weekend's wedding). 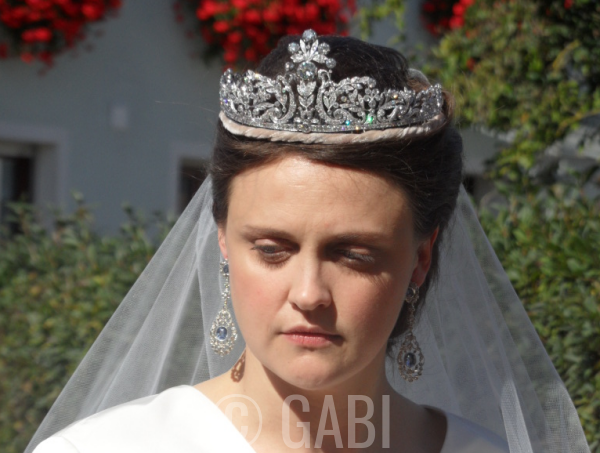 Our post on Astrid's gala jewels from earlier this summer also contains numerous other images of her wearing the tiara. I want to give a big thanks to Gabi, who took the photographs of the bride on Saturday, and Netty Leistra, my fellow royal blogger who clued me in to the event and wrote a fantastic post on the wedding. Please be sure to head over to Netty's blog for more information and more of Gabi's photos of other royal guests!